For all the people that absolutely love brunch, Vancouver is surprisingly not blessed with many great brunch spots. 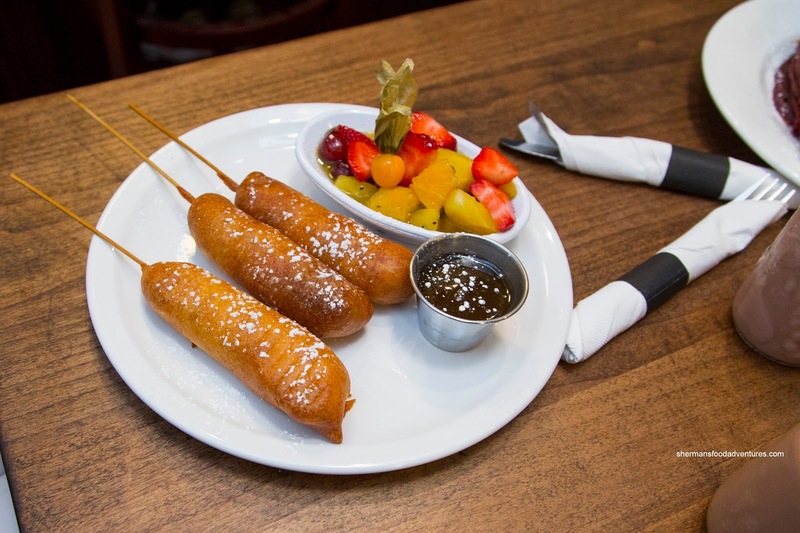 Yes, we have The Red Wagon, Yolks, Cafe Medina and BLVD Bistro, but really, that's about it. I know many will point out that many restaurants and hotels in town offer decent brunch, but let's just stick with the places specifically dedicated to the craft. 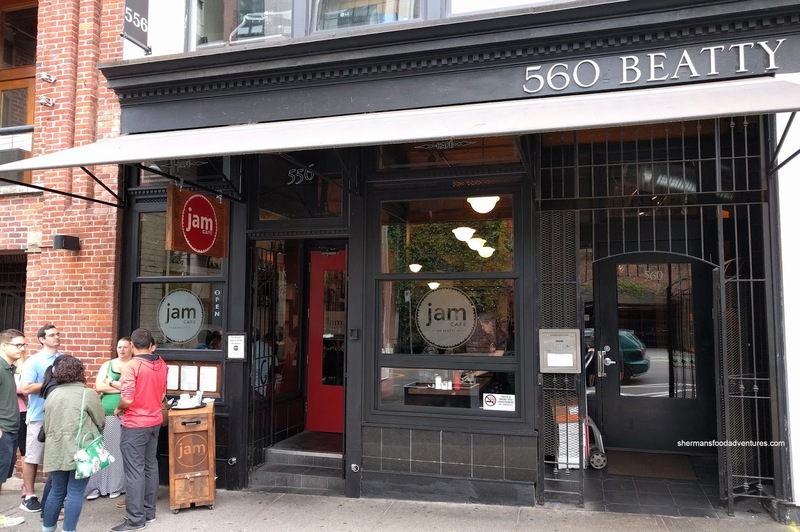 Enter Jam Cafe, yes that popular spot in Victoria that sports large portions at reasonable prices. Located on Beatty Street in the old Cafe Medina location, we now see the same lineups that grace the Victoria location. To illustrate their portion sizes, when the Red Velvet Pancakes hit the table, it looked more like a triple-layer cake more than a breakfast item. In fact, it sure at like it too. We ended asking for the cream cheese icing on the side and that was a good thing as it was pretty sweet (but not too much so). 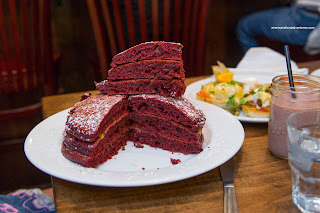 I found the pancakes to be on point with a super moist interior that was well, "cakey". There was a rich chocolate flavour that wasn't sweet at all. Hence, when combined with the cream cheese icing, it was just right. My son had eyes on the The 3 Pigs with sausages fried in pancake batter. I was only moderately okay with these despite his enthusiasm. The batter wasn't as fluffy as I would've expected and it wasn't as crispy on the outside either. The sausage in the middle was meaty and well-spiced though. We weren't fans of the side of fruit salad as it looked like it had been sitting for awhile. 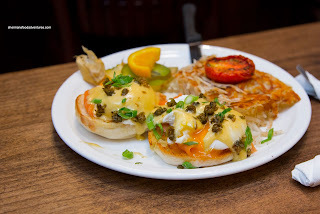 We also had the Smoked Salmon Benny topped with fried capers and served with hashbrowns. The eggs were nicely poached being runny while not raw. Buttery with a hint of lemon, the Hollandaise had a nice silky consistency. As much as the fried capers provided both a crunch and salty hit, there was a bit too many of them. We had to brush off half so the dish wasn't too salty. The side of hasbrowns were fantastic though being thoroughly crispy on the outside and fluffy soft on the inside. Our last item was the Chicken & Waffles with country gravy and fried eggs on top. I thought the chicken was fantastic being moist and well-seasoned with a flavourful crunchy exterior. 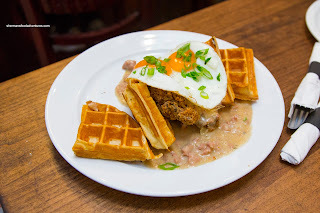 The gravy was meaty and rich with plenty of meat, however, the waffles were a bit lifeless. 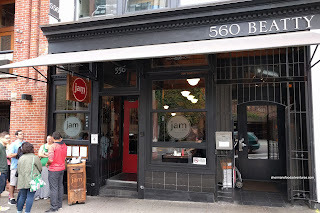 Certain imperfections aside, we still enjoyed our breakfast at Jam. Prices were reasonable and the portions were huge.